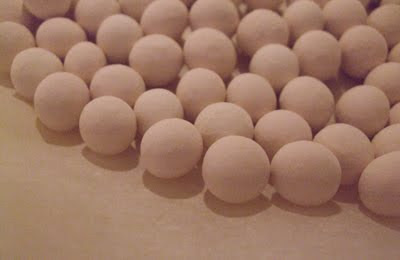 Whey drains out of yogurt. 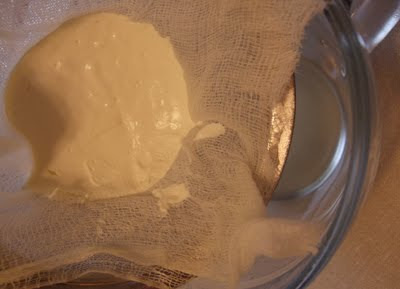 I put 1 cup of yogurt in a cheesecloth-lined strainer. The liquid seeped out over two days. The first time I made this recipe, I was underwhelmed. The ricotta was just there, thick and bland. So were the summer squash medallions. The tomato sauce, however — nothing more than a can of doctored tomatoes — was flavorful and complex, a little spicy, a little sweet. This tart has potential, I thought. 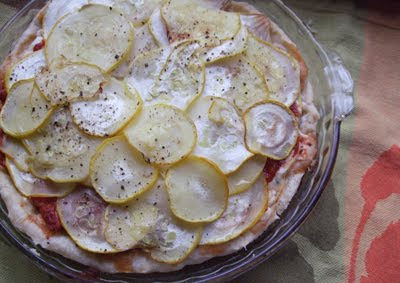 The second time I tangled with the lasagna tart, I was confident my modifications would make the recipe a keeper. 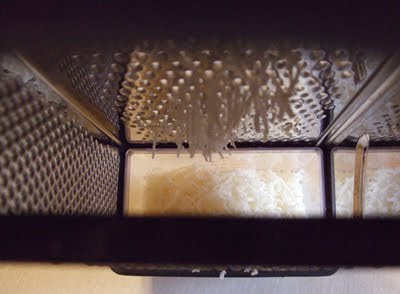 Finely grated Parmigiano Romano improves the cheese filling. I changed up the cheese layer; instead of straight-up ricotta, I made soft yogurt cheese and mixed it with Parmigiano Romano, goat cheese, olive oil, pepper and fresh basil and Italian parsley. It was tangy and creamy. The intensity of the cheese filling now matched the intensity of the tomato sauce. 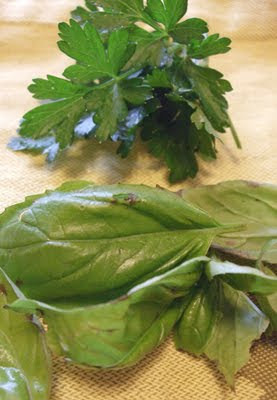 Basil and Italian parsley add pop to the cheese filling. Unfortunately, the star of the tart, the butterstick squash, that didn’t rise to the occasion. The second time around, even though I drizzled it with olive oil and gave it a wee blanket of ground pepper, the squash still was just there, tasting like a raw vegetable and not much more. The cheese and sauce were turned to 11, and the squash was kicking it in mono. Blind baking with pie weights keeps the crust from puffing up. This isn’t a bad recipe. If you like the taste of raw squash, you’d probably like it a lot. Some bacon crumbles could liven things up. But I’ve given it two tries, and I’m ready to move on. How would you improve this tart? I’m curious, readers: What recipes have let you down? Did you give them another chance? This made one tart in a 9-inch pie pan. Preheat oven to 325 degrees Fahrenheit. Make pie crust. If you’re following the directions in the link, you’ll need to blind bake the crust. To blind bake, roll out the dough for the tart shell and put it in a 9-inch pie pan. Line the shell with parchment paper, and put pie weights or dry beans in the shell. Bake for 20-25 minutes. Remove the weights and continue baking for another 15 minutes or until crust is golden brown. This is my second version of the tart. Notice how watery it is. I was in a rush, and I didn’t let enough water seep out of the squash. You’ve still got loads of time while the crust bakes! Let’s make the tomato sauce. Add garlic, olive oil, red pepper flakes, and salt to a small saucepan. Turn on heat. When the garlic starts to sizzle, add the can of crushed tomatoes. Bring to a simmer and cook for about 10 minutes to thicken sauce. Remove from heat. The cheese filling is seasoned with olive oil, salt, and lots of ground pepper (if you’re me). The sauce is under control; make the cheese filling. 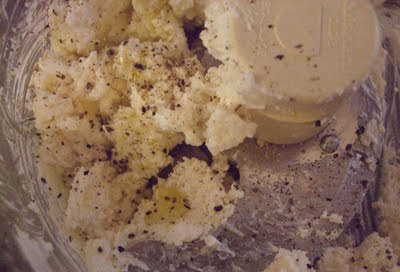 Add yogurt cheese, goat cheese, and Parmigiano Romano to the bowl of a food processor. Blitz to thoroughly combine. Add olive oil and blitz 2-3 times. Add herbs and blitz 2-3 times (not so many times that the cheese filling is a consistent color; you want flecks of green throughout). Add salt and pepper and blitz 2-3 times. If the filling is too thick and sticky, add a splash or two of water. It needs to be thin enough to spread over squash, but not so thin that it’s runny. Error on the thick side. When the crust is done blind baking, take it from the oven, and turn the oven to 375 degrees. This is my first attempt with the tart. The layers you see here follow my directions. If you were observant, you would notice that the layers of my second tart were in a different order. Also, I allowed a lot of water to drain off the squash in the first version version you see here, and there’s no water at the bottom of the pie pan. While the temperature is rising, assemble the tart. Spread half the cheese filling across the bottom of the crust. Spoon half the sauce over the cheese. 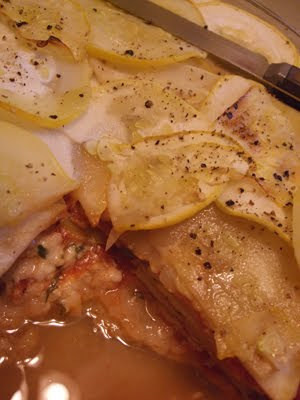 Arrange half the squash in a layer over the sauce. Drizzle a bit of olive oil and grind a bit of black pepper over the squash. Spread the remaining cheese over squash. Add another squash layer, and flavor with olive oil and pepper. 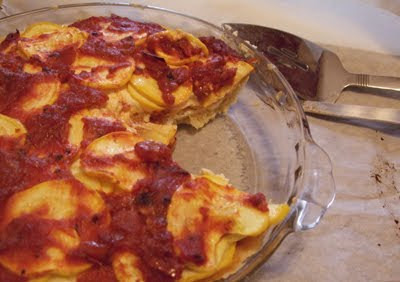 Top tart with remaining tomato sauce. The tart, take two. See how I goofed on the layers? To be honest, I don’t think the order matters much. I think the squash looks nice on top. Bake tart on a rimmed baking sheet (in case of overflow) for 40 minutes. This is amazing in theory. I'm going to spend a stupid amount of time today trying to figure out what to do about the squash not bringing the love. The first thing I wonder about is giving the squash a bit of a roast beforehand to set some of the flavors in it. hmmm…I may have to try it myself to see what can be done. HOLY YUM. I would never have the patience to cook it, but I'd sure have the desire to eat it!